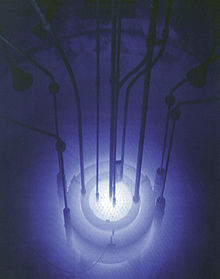 Cherenkov radiation glowing in the core of the Advanced Test Reactor. Cherenkov radiation (pronunciation: /tʃɛrɛnˈkɔv/) is an electromagnetic radiation emitted when a charged particle (such as an electron) passes through a dielectric medium at a speed greater than the phase velocity of light in that medium. 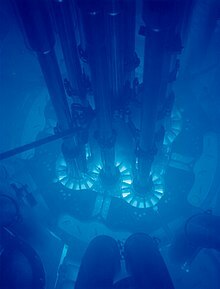 The characteristic blue glow of an underwater nuclear reactor is due to Cherenkov radiation. The radiation is named after the Soviet scientist Pavel Cherenkov, the 1958 Nobel Prize winner, who was the first to detect it experimentally under the supervision of Sergey Vavilov at the Lebedev Institute in 1934. Therefore it is also known as Vavilov–Cherenkov radiation. Cherenkov saw a faint bluish light around a radioactive preparation in water during experiments. His doctorate thesis was on luminescence of uranium salt solutions that were excited by gamma rays instead of less energetic visible light, as done commonly. He discovered the anisotropy of the radiation and came to the conclusion that the bluish glow was not a fluorescent phenomenon. A theory of this effect was later developed in 1937 within the framework of Einstein's special relativity theory by Cherenkov's colleagues Igor Tamm and Ilya Frank, who also shared the 1958 Nobel Prize. Cherenkov radiation as conical wave front had been theoretically predicted by the English polymath Oliver Heaviside in papers published between 1888 and 1889 and by Arnold Sommerfeld in 1904, but both had been quickly forgotten following the relativity theory's restriction of super-c particles until the 1970s. Marie Curie observed a pale blue light in a highly concentrated radium solution in 1910, but did not investigate its source. In 1926, the French radiotherapists Lucien Mallet described the luminous radiation of radium irradiating water having a continuous spectrum. A common analogy is the sonic boom of a supersonic aircraft. The sound waves generated by the supersonic body propagate at the speed of sound itself; as such, the waves travel slower than the speeding object and cannot propagate forward from the body, instead forming a shock front. In a similar way, a charged particle can generate a light shock wave as it travels through an insulator. Moreover, the velocity that must be exceeded is the phase velocity of light rather than the group velocity of light. The phase velocity can be altered dramatically by employing a periodic medium, and in that case one can even achieve Cherenkov radiation with no minimum particle velocity, a phenomenon known as the Smith–Purcell effect. In a more complex periodic medium, such as a photonic crystal, one can also obtain a variety of other anomalous Cherenkov effects, such as radiation in a backwards direction (see below) whereas ordinary Cherenkov radiation forms an acute angle with the particle velocity. Cherenkov radiation in the Reed Research Reactor. In their original work on the theoretical foundations of Cherenkov radiation, Tamm and Frank wrote,"This peculiar radiation can evidently not be explained by any common mechanism such as the interaction of the fast electron with individual atom or as radiative scattering of electrons on atomic nuclei. On the other hand, the phenomenon can be explained both qualitatively and quantitatively if one takes in account the fact that an electron moving in a medium does radiate light even if it is moving uniformly provided that its velocity is greater than the velocity of light in the medium.". However, some misconceptions regarding Cherenkov radiation exist: for example, it is believed that the medium becomes electrically polarized by the particle's electric field. If the particle travels slowly then the disturbance elastically relaxes back to mechanical equilibrium as the particle passes. When the particle is traveling fast enough, however, the limited response speed of the medium means that a disturbance is left in the wake of the particle, and the energy contained in this disturbance radiates as a coherent shockwave. Such conceptions do not have any analytical foundation, as electromagnetic radiation is emitted when charged particles move in a dielectric medium at subluminal velocities which are not considered as Cherenkov radiation. The geometry of the Cherenkov radiation shown for the ideal case of no dispersion. for water at 20 °C. Note that since this ratio is independent of time, one can take arbitrary times and achieve similar triangles. The angle stays the same, meaning that subsequent waves generated between the initial time t=0 and final time t will form similar triangles with coinciding right endpoints to the one shown. A reverse Cherenkov effect can be experienced using materials called negative-index metamaterials (materials with a subwavelength microstructure that gives them an effective "average" property very different from their constituent materials, in this case having negative permittivity and negative permeability). This means, when a charged particle (usually electrons) passes through a medium at a speed greater than the phase velocity of light in that medium, that particle will emit trailing radiation from its progress through the medium rather than in front of it (as is the case in normal materials with, both permittivity and permeability positive). One can also obtain such reverse-cone Cherenkov radiation in non-metamaterial periodic media where the periodic structure is on the same scale as the wavelength, so it cannot be treated as an effectively homogeneous metamaterial. is the speed of light in vacuum. Unlike fluorescence or emission spectra that have characteristic spectral peaks, Cherenkov radiation is continuous. Around the visible spectrum, the relative intensity per unit frequency is approximately proportional to the frequency. That is, higher frequencies (shorter wavelengths) are more intense in Cherenkov radiation. This is why visible Cherenkov radiation is observed to be brilliant blue. In fact, most Cherenkov radiation is in the ultraviolet spectrum—it is only with sufficiently accelerated charges that it even becomes visible; the sensitivity of the human eye peaks at green, and is very low in the violet portion of the spectrum. varies with frequency (and hence with wavelength) in such a way that the intensity cannot continue to increase at ever shorter wavelengths, even for very relativistic particles (where v/c is close to 1). At X-ray frequencies, the refractive index becomes less than unity (note that in media the phase velocity may exceed c without violating relativity) and hence no X-ray emission (or shorter wavelength emissions such as gamma rays) would be observed. However, X-rays can be generated at special frequencies just below the frequencies corresponding to core electronic transitions in a material, as the index of refraction is often greater than 1 just below a resonant frequency (see Kramers-Kronig relation and anomalous dispersion). As in sonic booms and bow shocks, the angle of the shock cone is directly related to the velocity of the disruption. The Cherenkov angle is zero at the threshold velocity for the emission of Cherenkov radiation. The angle takes on a maximum as the particle speed approaches the speed of light. Hence, observed angles of incidence can be used to compute the direction and speed of a Cherenkov radiation-producing charge. Cherenkov radiation can be generated in the eye by charged particles hitting the vitreous humour, giving the impression of flashes, as in cosmic ray visual phenomena and possibly some observations of criticality accidents. Cherenkov radiation is widely used to facilitate the detection of small amounts and low concentrations of biomolecules. Radioactive atoms such as phosphorus-32 are readily introduced into biomolecules by enzymatic and synthetic means and subsequently may be easily detected in small quantities for the purpose of elucidating biological pathways and in characterizing the interaction of biological molecules such as affinity constants and dissociation rates. 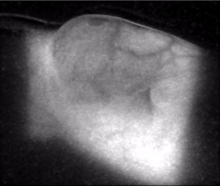 Cherenkov light emission imaged from the chest wall of a patient undergoing whole breast irradiation, using 6 MeV beam from a linear accelerator in radiotherapy. More recently, Cherenkov light has been used to image substances in the body. These discoveries have led to intense interest around the idea of using this light signal to quantify and/or detect radiation in the body, either from internal sources such as injected radiopharmaceuticals or from external beam radiotherapy in oncology. Radioisotopes such as the positron emitters 18F and 13N or beta emitters 32P or 90Y have measurable Cherenkov emission and isotopes 18F and 131I have been imaged in humans for diagnostic value demonstration. External beam radiation therapy has been shown to induce a substantial amount of Cherenkov light in the tissue being treated, due to the photon beam energy levels used in the 6 MeV to 18 MeV ranges. The secondary electrons induced by these high energy x-rays result in the Cherenkov light emission, where the detected signal can be imaged at the entry and exit surfaces of the tissue. 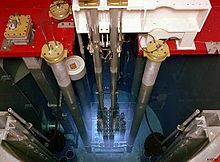 Cherenkov radiation in a TRIGA reactor pool. Cherenkov radiation is used to detect high-energy charged particles. In pool-type nuclear reactors, beta particles (high-energy electrons) are released as the fission products decay. The glow continues after the chain reaction stops, dimming as the shorter-lived products decay. Similarly, Cherenkov radiation can characterize the remaining radioactivity of spent fuel rods. This phenomenon is used to verify the presence of spent nuclear fuel in spent fuel pools for nuclear safeguards purposes. When a high-energy (TeV) gamma photon or cosmic ray interacts with the Earth's atmosphere, it may produce an electron-positron pair with enormous velocities. The Cherenkov radiation emitted in the atmosphere by these charged particles is used to determine the direction and energy of the cosmic ray or gamma ray, which is used for example in the Imaging Atmospheric Cherenkov Technique (IACT), by experiments such as VERITAS, H.E.S.S., MAGIC. Cherenkov radiation emitted in tanks filled with water by those charged particles reaching earth is used for the same goal by the Extensive Air Shower experiment HAWC, the Pierre Auger Observatory and other projects. Similar methods are used in very large neutrino detectors, such as the Super-Kamiokande, the Sudbury Neutrino Observatory (SNO) and IceCube. Other projects operated in the past applying related techniques, such as STACEE, a former solar tower refurbished to work as a non-imaging Cherenkov observatory, which was located in New Mexico. Astrophysics observatories using the Cherenkov technique to measure air showers are key to determine the properties of astronomical objects that emit Very High Energy gamma rays, such as supernova remnants and blazars. Cherenkov radiation is commonly used in experimental particle physics for particle identification. One could measure (or put limits on) the velocity of an electrically charged elementary particle by the properties of the Cherenkov light it emits in a certain medium. If the momentum of the particle is measured independently, one could compute the mass of the particle by its momentum and velocity (see four-momentum), and hence identify the particle. is the refractive index of the medium) by looking at whether this particle does or does not emit Cherenkov light in a certain medium. Knowing particle momentum, one can separate particles lighter than a certain threshold from those heavier than the threshold. The most advanced type of a detector is the RICH, or Ring-imaging Cherenkov detector, developed in the 1980s. In a RICH detector, a cone of Cherenkov light is produced when a high speed charged particle traverses a suitable medium, often called radiator. This light cone is detected on a position sensitive planar photon detector, which allows reconstructing a ring or disc, the radius of which is a measure for the Cherenkov emission angle. Both focusing and proximity-focusing detectors are in use. In a focusing RICH detector, the photons are collected by a spherical mirror and focused onto the photon detector placed at the focal plane. The result is a circle with a radius independent of the emission point along the particle track. This scheme is suitable for low refractive index radiators—i.e. gases—due to the larger radiator length needed to create enough photons. In the more compact proximity-focusing design, a thin radiator volume emits a cone of Cherenkov light which traverses a small distance—the proximity gap—and is detected on the photon detector plane. The image is a ring of light, the radius of which is defined by the Cherenkov emission angle and the proximity gap. The ring thickness is determined by the thickness of the radiator. An example of a proximity gap RICH detector is the High Momentum Particle Identification Detector (HMPID), a detector currently under construction for ALICE (A Large Ion Collider Experiment), one of the six experiments at the LHC (Large Hadron Collider) at CERN.
. This type of radiation (VCR) is used to generate high power microwaves. ^ Nahin, P. J. (1988). Oliver Heaviside: The Life, Work, and Times of an Electrical Genius of the Victorian Age. pp. 125–126. ISBN 978-0-8018-6909-9. ^ L'Annunziata, Michael F. (2016). Radioactivity: Introduction and History, From the Quantum to Quarks. pp. 547–548. ISBN 978-0-444-63489-4. ^ Marguet, Serge (2017). The Physics of Nuclear Reactors. p. 191. ISBN 978-3-319-59559-7. ^ a b Luo, C.; Ibanescu, M.; Johnson, S. G.; Joannopoulos, J. D. (2003). "Cerenkov Radiation in Photonic Crystals" (PDF). Science. 299 (5605): 368–71. Bibcode:2003Sci...299..368L. CiteSeerX 10.1.1.540.8969. doi:10.1126/science.1079549. PMID 12532010. ^ Genevet, P.; Wintz, D.; Ambrosio, A.; She, A.; Blanchard, R.; Capasso, F. (2015). "Controlled steering of Cherenkov surface plasmon wakes with a one-dimensional metamaterial". Nature Nanotechnology. 10. pp. 804–809. Bibcode:2015NatNa..10..804G. doi:10.1038/nnano.2015.137. ^ Schewe, P. F.; Stein, B. (24 March 2004). "Topsy turvy: The first true "left handed" material". American Institute of Physics. Archived from the original on 2009-01-31. Retrieved 1 December 2008. ^ Bolotovskii, B. M. (2009). "Vavilov – Cherenkov radiation: Its discovery and application". Physics-Uspekhi. 52 (11): 1099–1110. Bibcode:2009PhyU...52.1099B. doi:10.3367/UFNe.0179.200911c.1161. ^ Liu, H.; Zhang, X.; Xing, B.; Han, P.; Gambhir, S. S.; Cheng, Z. (21 May 2010). "Radiation-luminescence-excited quantum dots for in vivo multiplexed optical imaging". Small. 6 (10): 1087–91. doi:10.1002/smll.200902408. PMID 20473988. ^ Liu, Hongguang; Ren, Gang; Liu, Shuanglong; Zhang, Xiaofen; Chen, Luxi; Han, Peizhen; Cheng, Zhen (2010). "Optical imaging of reporter gene expression using a positron-emission-tomography probe". Journal of Biomedical Optics. 15 (6): 060505–060505–3. Bibcode:2010JBO....15f0505L. doi:10.1117/1.3514659. PMC 3003718. PMID 21198146. ^ Zhong, Jianghong; Qin, Chenghu; Yang, Xin; Zhu, Shuping; Zhang, Xing; Tian, Jie (2011). "Cerenkov Luminescence Tomography for In Vivo Radiopharmaceutical Imaging". International Journal of Biomedical Imaging. 2011: 1–6. doi:10.1155/2011/641618. PMC 3124671. PMID 21747821. ^ Sinoff, C. L (1991). "Radical irradiation for carcinoma of the prostate". South African Medical Journal = Suid-Afrikaanse Tydskrif Vir Geneeskunde. 79 (8): 514. PMID 2020899. ^ Mitchell, G. S; Gill, R. K; Boucher, D. L; Li, C; Cherry, S. R (2011). "In vivo Cerenkov luminescence imaging: A new tool for molecular imaging". Philosophical Transactions of the Royal Society of London A. 369 (1955): 4605–19. Bibcode:2011RSPTA.369.4605M. doi:10.1098/rsta.2011.0271. PMC 3263789. PMID 22006909. ^ Das, S.; Thorek, D. L. J.; Grimm, J. (2014). "Cerenkov Imaging". Emerging Applications of Molecular Imaging to Oncology. Advances in Cancer Research. 124. pp. 213–34. doi:10.1016/B978-0-12-411638-2.00006-9. ISBN 9780124116382. PMC 4329979. PMID 25287690. ^ Spinelli, Antonello Enrico; Ferdeghini, Marco; Cavedon, Carlo; Zivelonghi, Emanuele; Calandrino, Riccardo; Fenzi, Alberto; Sbarbati, Andrea; Boschi, Federico (2013). "First human Cerenkography". Journal of Biomedical Optics. 18 (2): 020502. Bibcode:2013JBO....18b0502S. doi:10.1117/1.JBO.18.2.020502. PMID 23334715. ^ Jarvis, Lesley A; Zhang, Rongxiao; Gladstone, David J; Jiang, Shudong; Hitchcock, Whitney; Friedman, Oscar D; Glaser, Adam K; Jermyn, Michael; Pogue, Brian W (2014). "Cherenkov Video Imaging Allows for the First Visualization of Radiation Therapy in Real Time". International Journal of Radiation Oncology*biology*physics. 89 (3): 615–622. doi:10.1016/j.ijrobp.2014.01.046. PMID 24685442. ^ Branger, E; Grape, S; Jacobsson Svärd, S; Jansson, P; Andersson Sundén, E (2017). "On Cherenkov light production by irradiated nuclear fuel rods". Journal of Instrumentation (Submitted manuscript). 12 (6): T06001. Bibcode:2017JInst..12.6001B. doi:10.1088/1748-0221/12/06/T06001. ^ Macleod, Alexander J.; Noble, Adam; Jaroszynski, Dino A. (2018). "Cherenkov radiation from the quantum vacuum". arXiv:1810.05027 [hep-ph]. ^ Wang, Zhong-Yue (2016). "Generalized momentum equation of quantum mechanics". Optical and Quantum Electronics. 48 (2). doi:10.1007/s11082-015-0261-8. ^ Bugaev, S. P.; Kanavets, V. I.; Klimov, A. I.; Koshelev, V. I.; Cherepenin, V. A. (1983). "Relativistic multiwave Cerenkov generator". Soviet Technical Physics Letters. 9: 1385–1389. Bibcode:1983PZhTF...9.1385B. Landau, L. D.; Liftshitz, E. M.; Pitaevskii, L. P. (1984). Electrodynamics of Continuous Media. New York: Pergamon Press. ISBN 978-0-08-030275-1. Jelley, J. V. (1958). Cerenkov Radiation and Its Applications. London: Pergamon Press. Smith, S. J.; Purcell, E. M. (1953). "Visible Light from Localized Surface Charges Moving across a Grating". Physical Review. 92 (4): 1069. Bibcode:1953PhRv...92.1069S. doi:10.1103/PhysRev.92.1069. Wikimedia Commons has media related to Cherenkov radiation. Radović, Andrija (2002). "Cherenkov's Particles as Magnetons" (PDF). Journal of Theoretics. 4 (4): 1–5.